Many years ago, we fell in love with vibrancy of Buenos Aires, a city where cosmopolitan sophistication collides with an irresistibly chaotic energy. It's a beguiling, emotional and all embracing place to be. When we started Cau, our vision was to capture that spirit in a restaurant that would fit right into the heart of Palermo, Buenos Aires. Our menu embraces Buenos Aires cuisine, a melting pot of comfort food inspired by Italy and Spain alongside the jewel in Argentina's crown, it's beef. 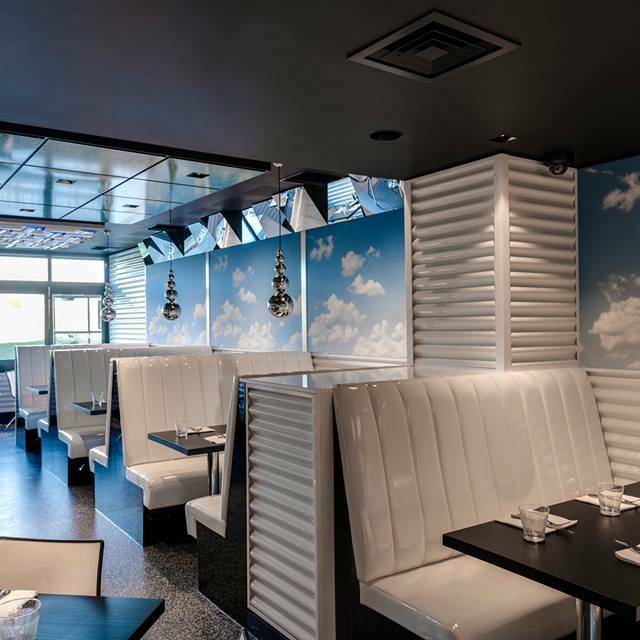 Mouthwatering steaks, burgers and steak sandwiches are joined by a tempting selection of more-ish favorites, each with a distinctive Buenos Aires twist. Drop in for some sharing plates and a beer over lunch or savour one of our speciality cuts and a bottle of Malbec over dinner...just don't forget to leave room for a corn flake ice cream sundae. Loved CAU! 100% recommend this place to anyone looking for a nice meal in Blackheath! 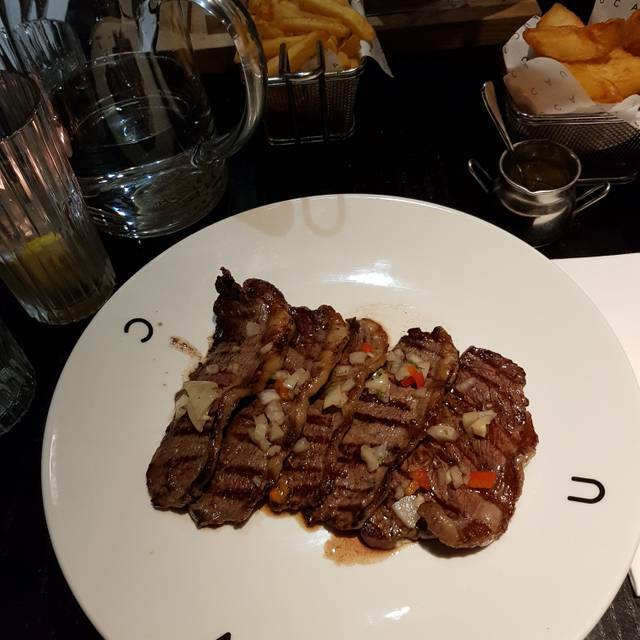 Great steak and cocktails - Thank you, CAU. fab food, cheap prices (especially for thebbottomless brunch) and lovely staff members. Excellent service and fabulous food. Very accommodating staff. Highly recommend. Food was ok. Portions were really small. Manager or owner was a sleaze and scruffy. Wouldn't go again. Wasn't value for money. The food was amazing & the service was really good too. Shame that even though I’d rang up before our meal, my husbands dessert didn’t come with a candle or happy birthday written on a plate or something. No major thing but would of made the meal outstanding in every way. We had a lovely evening at CAU. Service was very good and food was lovely. The staff were absolutely amazing in creating a wonderful birthday moment for my girlfriend. Service was fantastic and of course the food. But the staff win hands down on creating a special moment that she won’t forget! Thanks to the special ladies and wish I for their names but they know who they are. Fantastic food & fantastic service! Would recommend to all. Poor. From the food to the service so I’d recommend the Argentinian cafe a few doors down. There wasn’t one good aspect. The staff ignore you to chat to the chefs and the food was akin to a motorway service station. Definitely worth avoiding. Friendly but very slow and unorganized service. Food pretty good but a little over priced. The staff passed us our drinks, glasses and food across the table instead of placing it on the table. Our starters were cold and the steak mains were less than average. 1no main was taken off the bill at the end however. The staff would interrupt our group mid conversation which my elderly father found quite rude. me and my wife went for our anniversary and had heard positive reviews before, but i had to go myself. we had a fantastic meal i had tira di ancho which is £35 so it seems alot of money but it was amazing. my wife had ribeye steak and her was rare and it was spot on. Lovely food and visited a few times the only gripe is they bring your main meal up too quick after your starter. Celebrating son in law’s exam success. Picked Cau as recommended for excellent steaks. Would definitely go again as we had a great evening. The Deco, the drinks and food was beautiful. A quirky Modern restaurant.. would love if there was any more branches in london. The service was very slow, with us having to chase our initial drinks order and request items multiple times. The Manager was apologetic about the delays, but it wasn’t especially busy. Food was ok, some items were off the menu, but we weren’t told until quite some time after ordering them. 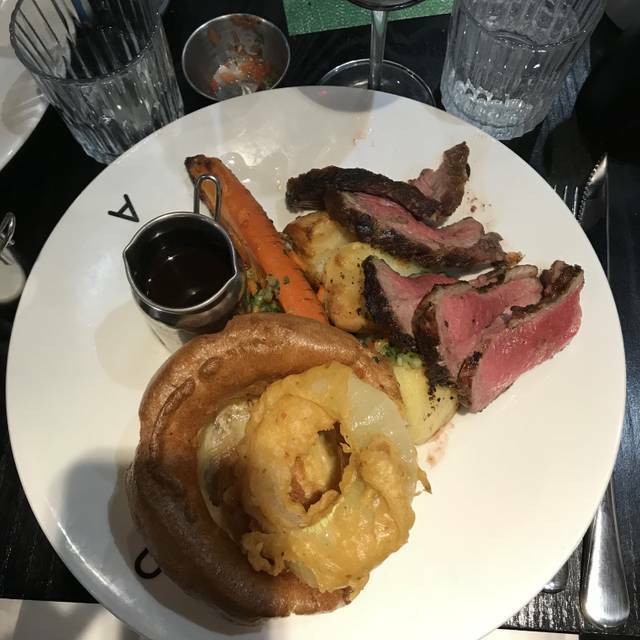 We had the beef Sunday roast and, while nice, the beef was heavily over salted, to the point were my partner couldn’t eat it. The meal was lovely, we were greeted by a lovely man and we had a table by the window before we have been here before and we asked for a table by the window and did not get one this time we did,The food was good we had a steak and the service was quick. Nothing special, food was nice, service was good. Nothing more to report. The food was mediocre. We ordered the pork belly bite as starter, though it's advertised as 'melt in your mouth', it was actually quite dry and a bit flavorless. The steaks were cooked to order, which is pretty good. The sides were bland and not remarkable. In short, it was quite expensive for the quality of the food. The waiters were very attentive. The general dining experience was let down by the noisy environment and cheaply decorated restaurant, with not much ambiance. It's not impressive at all, and disappointed to say the least. Great service and very good food. Good food, nice location and good service. Visited for a business lunch but would visit again with family and friends. Daughters birthday. Good food mediocre service. We booked the restaurant for mine & a friends 67th birthday. 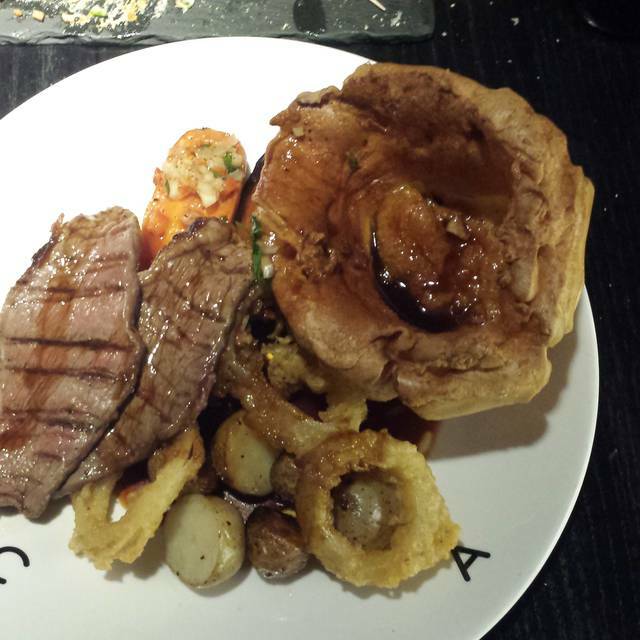 Although the service was very good, the restaurant was extremely busy and we had to shout to hear properly. We all ordered steaks with side dishes. Unfortunately, the food arrived cold and my side dish of mushrooms did not arrive at all. I brought this to the attention to our server when we paid the bill, as she did not know! There were a number of large parties in that night (Saturday 28th April) which detracted from our experience. We got the impression that there were too many diners and we were squeezed in near the windows, which was quite draughty. However, the waitress was very attentive and the service was good. I got the impression that the staff generally were struggling to cope with the demand. Otherwise, the decor was good. Unfortunately, I will not be recommending CAU to my friends. Food really didn’t live up to what was expected. Expensive for the what we received to be honest. Wouldn’t rush back. Went for the 'Cau Sunday roast' - generally good but would be improved by even a token piece of fresh 'green' vegetable!! Good, friendly service. For those with a sweet tooth, Dulce de Leche pancakes delicious. We came here for a family birthday meal. Food was fine. Could have done with more vegetables with the Sunday roast. One our group was not impressed with the Latin burger. Said Byron burger is better. We liked the desserts Service was OK.
Great steak and wine. Good value. I really enjoy coming to Cau but on my last experience the food wasn’t as good as on previous visits and felt overpriced for the quality. I am glad the belly of pork tempura is back on the menu though, that was the best part of our meal! 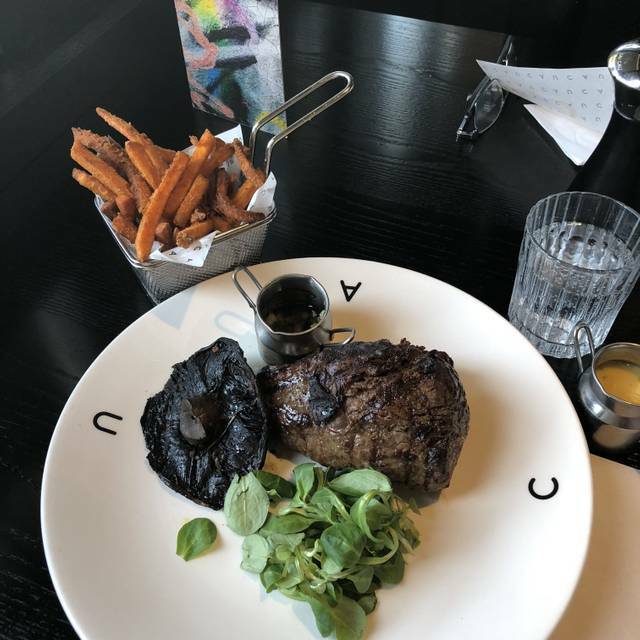 The first time we visited Cau Blackheath (on a Saturday) a year ago, the food and steak were amazing, encouraging us to visit again. We have visited multiple times since and the beef or cooking of it hasn't been up to scratch. We asked our waiter for a standard fillet steak and we were given the Lomito, fillet of rump. The beef was tough, hard and bland, and not what we were expecting from the pricier fillet steak you get in other restaurants . On the plus, the hand-cut chips were great and so were the starters (tacos and croquettes). Sadly, the main event of the show was disappointing and we are considering abandoning hope of ever having a fabulous steak like we did last year. We had breakfast which was delicious, and restaurant wasn’t too busy. Starters very nice, main meal of steak was overpriced and very fatty. Dessert of churros were not pleasant. Very disappointing as this restaurant had been recommended to us and it just didn't live up to it's reputation. Service was excellent and great atmosphere, shame about the food! Really enjoyed the food and ambiance of the restaurant. Staff were really friendly and generally good service and didn’t feel rushed after spending a lot of money but the only thing I would of liked is for the waiters to pour your wine and water when they see an empty glasses or at least ask. It felt like a chain restaurant didn’t have that personal touch. Only niggle I had but would highly recommend it. Great food, reasonably price. I would return, although I found the venue very loud on this occasion. Waitress was attentive without being too present.